At more than 1 million acres, Sonoma County is one of the most ecologically diverse places on the planet. It's a "biological hotspot," one of just 25 such areas in the world with a vast—but imperiled—reservoir of plant and animal life. But few of us experience this diversity, if for no other reason than most of it is off-limits. Unlike public-space-rich Marin County, which boasts a large swath of the 80,000-acre Golden Gate National Recreation Area and the 71,000-acre Point Reyes National Seashore, more than 90 percent of Sonoma County is locked up in private property. Local parks and public open spaces offer only a glimpse of the county's natural wonders. But that's what makes LandPaths' TrekSonoma such a gem. The multiday hiking and river trips allow participants to travel across miles of Sonoma County landscapes via public and private property—and to do it in style with great food and drink at the end of the trail. Meghan Walla-Murphy is an environmental consultant who works with LandPaths, a Santa Rosa nonprofit land-stewardship organization. She grew up in Los Angeles, but now lives in Sonoma County. When locals learn she's from L.A., they pity her, but she points out that she was the lucky one with access to far more open space in the Santa Monica National Recreation Area. "There's actually less open space in Sonoma County than where I grew up in L.A. We have to work to get to places here." The beauty of TrekSonoma is that it makes some of those inaccessible places accessible. "Not only does it connect people back to the land, but it also brings awareness of the need for contiguous permeable connected habitat," Walla-Murphy says. Landscapes fragmented by fences, roads and development are detrimental for wildlife, who need unimpeded corridors, she says. The routes TrekSonoma participants travel offer a visceral experience along these wildlife passages. Lee Hackeling, LandPaths' mission and strategic director, came up with the idea for TrekSonoma in 2008, but the idea was planted earlier. She and her husband, Craig Anderson, LandPaths' executive director, took a hut-to-hut trip on their honeymoon in Tuscany in 1999 and later hiked the Annapurna Trail in Nepal. She admits the idea isn't new, but it was new to Sonoma County. "Why do I have to travel all the way over there to do this," Hackeling wondered back in 2008. "Why don't we do it here?" 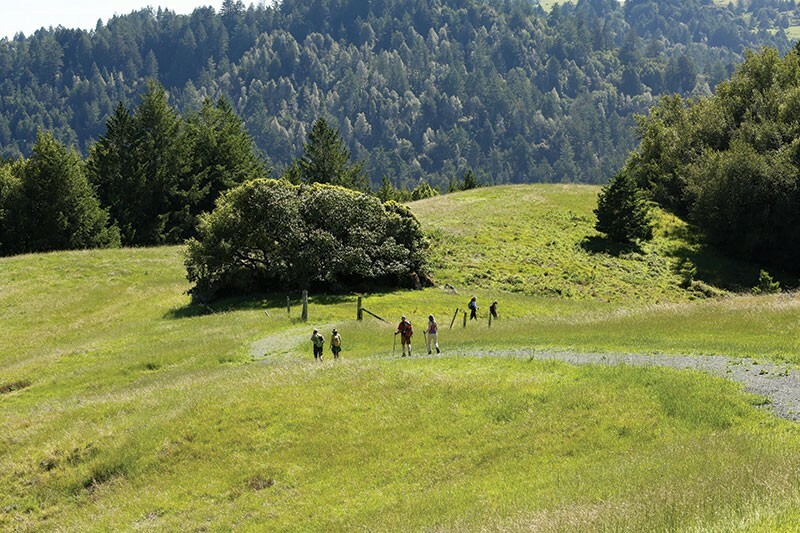 Now in its eighth year, TrekSonoma is expanding with three new routes: a Geyserville to Memorial Beach Russian River trip for 12- to 14-year-old-kids that includes an overnight at Front Porch Farm in Healdsburg; a family-oriented two-day hike from Shell Beach to Willow Creek Ranch and back; and a "Wooly Weekend" this fall that will follow traditional sheep-herding trails along the San Antonio Creek watershed near Petaluma with stays at local sheep ranches—this is in addition the signature "Bohemian to the Sea" hike, a 20-mile, three-day journey from LandPaths' Bohemian Ecological Preserve near Monte Rio to Shell Beach. 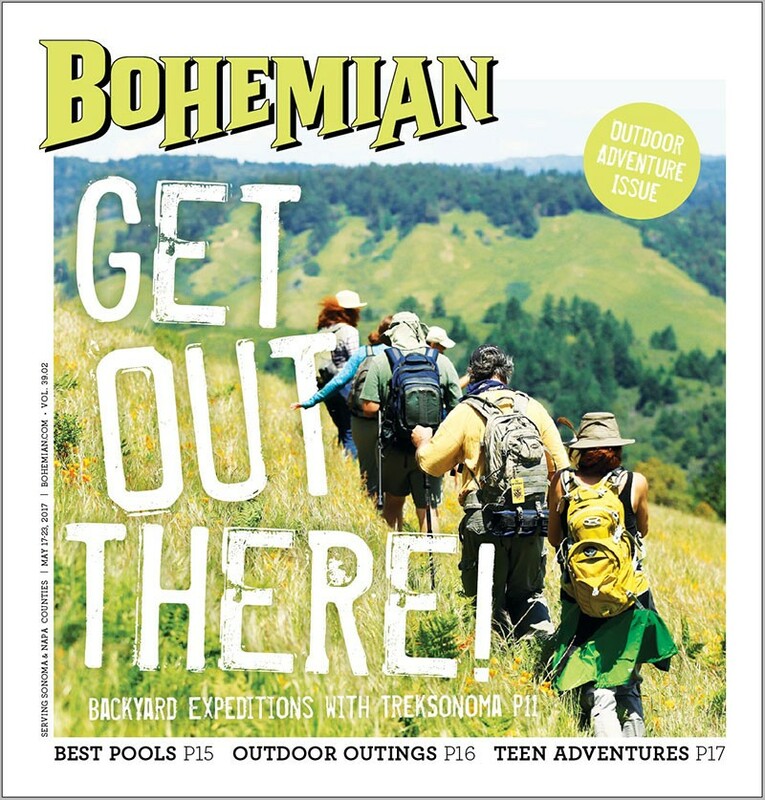 Prices range from $125 for the family trip to $625 for Bohemia to the Sea. Scholarships are available and the LandPaths just did a trek for teens that was underwritten by donors. Will and Julie Parish own a 300-acre ranch adjacent to Land Paths' Bohemia Preserve and happily provide access to TrekSonoma participants. Julie Parish says the existing culture of making land accessible motivated her and her husband to work with LandPaths. "Sharing our land with the public has been a dream," says parish. "TrekSonoma is a way for us to really participate in that network of community building and provide access. It's a win for everyone." For Anderson, the trips are not only the great way to experience Sonoma County in all its diversity, but they offer a means of reconnecting with the land. "The only thing we're doing that's original is to reawaken a culture that has a strong relationship of place and works to provide access, to steward and to protect," Anderson says. "It hasn't been done here since our forbearers got really excited about the Buick. And that's what's killed it." Time and again, Anderson says he sees conversations and relationships created that he says can only happen on the land. "Human beings need places to gather that are not self-selected vortexes, like the mall or church, work or a music venue, where you're mixing with the entire community. Land is the only place that I know provides that." Meanwhile, the trips are developing a new kind of tourism that goes beyond winetasting, with real benefits for the land. "You have an influx of dollars coming in that are not wanting to see the latest film or restaurant or wineries," says Anderson, "but people are paying to walk and eat local food that's grown in a fair way and to see trees that their dollars are helping to protect. That's pretty powerful." He and Hackeling have dreams for other routes because there's still so much to see. "We can't resist it," says Hackeling. "I would like someone to be able to walk from Sonoma to Gualala," says Anderson. "That's a two-hour drive. But it's a 10-day walk if someone chooses to do it. That would be a really deep immersion into this place."